You might be a germaphobe who carries hand sanitizer in a fanny pack, but it turns out that you can’t really control the prime cause of the flu. According to researchers from Sweden’s University of Gothenberg, who published their findings in the Journal of Clinical Virology last November, flu contagions start when the temperature suddenly descends below freezing. That might explain why coughing and sneezing envelopes your neighborhood during freak cold snaps -- like the one that hit the southeast earlier this month. 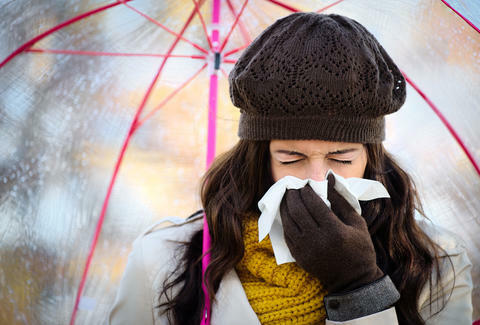 Using 20,000 nasal swabs over the course of three seasons, scientists compared the number of respiratory viruses found with weather data from the Swedish Meteorological and Hydrological Institute. That was enough to determine that flu outbreaks typically occur during the first cold snap of the year, when dry air couples with low temperatures. "We believe that this sudden drop in temperature contributes to 'kickstart' the epidemic. Once the epidemic has started, it continues even if temperatures rise. Once people are sick and contagious, many more may become infected,” said Nicklas Sundell, a researcher at Sweden’s Sahlgrenska Academy. The study doesn’t advance any new ideas as to how cold weather influences flu outbreaks. But the research does reinforce one popular theory regarding aerosol particles, which often harbor viruses and proliferate in cold and dry weather. It’s these aerosol particles that are the real suckers. So make sure you bundle up and take the necessary precautions this winter season, like getting a flu shot. Campbell's Soup is also pretty good.